Recently, we showed you a version of the Minimum Advertised Pricing list for Verizon which included the HTC Rezound (formerly the HTC Vigor) and the Samsung GALAXY Nexus. Absent was the Motorola DROID RAZR-until now. 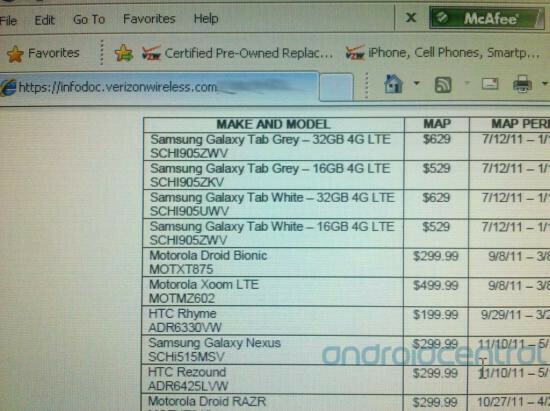 The latest version of Verizon's MAP list shows a hastily added DROID RAZR at the bottom of the list with a possible launch date of October 27th and a price of $299.99. The price was already announced by Verizon when the super-thin LTE enabled phone was introduced, but originally the word was that the Motorola DROID RAZR would be up for pre-orders on October 27th with a launch later the next month. Considering the impressive success that the MAP has had in forecasting launch dates and prices, we have to take seriously the possibility that Verizon's new flagship DROID could be in your hand quicker than you thought. As far as the HTC Rezound and the Samsung GALAXY Nexus are concerned, it was only today that the latter was confirmed to be heading to Big Red. Both the Rezound and the GALAXY Nexus are expected to launch November 10th at a price of $299.99. Once again, we remind you that the MAP list is a document that shows the lowest price that re-sellers can sell new phones for. The idea is to prevent quick discounting of new phones which might make customers concerned that either there is a problem with the handset or that it is unpopular. The list is not designed to reveal launch dates and prices. One thing I wanna point out that a lot of people seem to have forgotten or didn't know is that since Motorola is now using Super Amoled pentile displays there won't be any horrible pixelations. As a former owner of the Super Amoled Epic 4G and Droid 3, you can def see the pixelation difference on the devices. Both have a 4 inch display and depsite that the Droid 3 has the qhd display the Epic had much less pixelation. Motorola is very smart to make this change, not just because Super Amoled is much better than LCD but for this reason as well. My understanding is this device comes with Super AMOLED as opposed to the better Super AMOLED Plus. There's been complaints about the text quailty when it doesn't have the "Plus" designation. There's also complaints of blue/green tine, loss of sharpness, loss of detail, etc., respectively. Interesting regarding the prospective October 27th release date. However, I would have expected something from VZW by now if the 27th is really the release date. Like say, an announcement of when pre-orders will be opened. I signed up on VZW's RAZR web page for updates, and so far, silence from VZW. October 27th would be great for the RAZR to become available, but with the silence from VZW to date, I don't know. Yeah, so I pay 299.99 for 32GB, when a 16GB would normally cost 199.99 and a 16GB card, even class 10, can be purchased for less than 100... I dunno. I suppose I could dump data onto my Dropbox or MInus account. All Windows Phones ? N9 with Meego ? MAP is pretty much the Verizon retailers world's equivalent of MSRP. Verizon's Infocenter page (from which the MAP pages are typically linked) says in no uncertain terms that retailers are free to sell the phones at any price they feel so inclined; it all depends on how much of a loss above and beyond the subsidy that retailer is willing to take on the handset. This is why you see mega-companies like Amazon willing to discount the phones to next to nothing. Taking massive hits on them means next to nothing when you take into account the double contract (yes, you sign an additional contract with Amazon when you activate a phone through them, don't you love small print?) with it's monstrous additional ETF looming. Even smaller, regional retailers will discount phone prices well below MAP to drive business into their stores during sales. LOL I was about to say the same, signed in, and voila you beat me. Nice. MAP is Minimum ADVERTISED Price. PA really needs to check their facts sometimes, this mistake has been made before. What did they get wrong. It says Minimum Advertise Price in the first sentence? How about you read the last paragraph? "Once again, we remind you that the MAP list is a document that shows the lowest price that re-sellers can s̶e̶l̶l̶ advertise new phones for. " Don't see your point. Verizon won't allow a reseller to sell at lower than the MAP. Minor difference - sell vs. advertise. This phone is taunting me! Can't wait to burn my upgrade on this thing. Verizon needs to change their 4g price tag to 199.00$ if they want to sell more DROIDS. 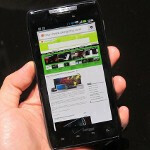 The 27th is pre orders for the RAZR!! Yawnnnnnn.... Blip blippp. Hey ve-rrippoff... show us a real unlimited data deal and we will be excited. otherwise it's just a shiny new paperweight. Blah HUmmbug.